High Yield Investment Programs - running statistics on failed sites. Why do some HYIP programs fail and how can we predict them stopping? When should we pull out? . Statistics taken from the HYIP sites help to predict trouble. The data they provide on a daily basis has greater use when collected on a daily basis. Only then can trends be observed and judgements made on those observations. Days - the number of days the site has been running. I don't usually catch the programs start. Members - the number of active members in the program - where a choice is given. Total Deposits - includes reinvestment so only a proportion is new money coming in. Today Deposits - includes reinvestments and varies wildly depending on when I take the stats. Total withdrawal - but not actually paid yet as some may be pending manual review and payment. I deposit $2.00 of e-gold in a 2 day plan that pays 120%. After two days it is worth $2.40. I reinvest the $2.40 and withdraw $2.88 two days later. My account statistics show Total Deposit $4.40 ($2+$2.40), Earned Total $5.28 ($2.40+$2.88) and Total Withdrawl $2.88. Factual, but needs to be taken into account when analysing the statistics. Not all sites have the same stats and some publish none at all. Some start with lots of information and then restrict it later on. 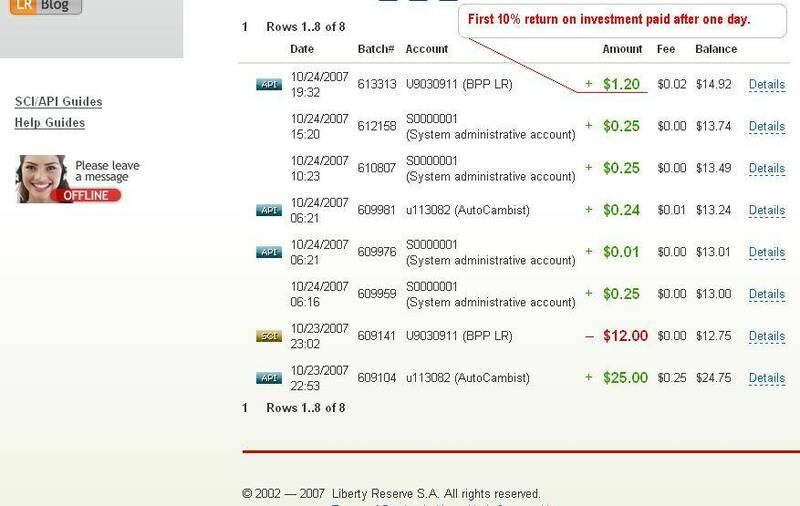 Profits shown are the lowest returns published for each site. Most sites talk of 150% profit when 100% of that is your investment and so 50% is what I call profit ! Business Profit Pro is a profit share type of HYIP where the daily return is not fixed but varies as a percentage of the site's profits at the end of each day. This site is capped at 10% maximum return daily so should last a long time. Although the minimum stake is $1, in practice you need to start with about $100 and set the compounding level to your choice (I use 80% compounding). Returns about 1 to 2% per day at present and paying very promptly. This site uses Liberty Reserve e-money which has prooved clear of account blocking. (e-gold and e-bullion have had a spate of blocks recently). Use AutoCambist to move e-money, like e-gold to Liberty Reserve (LR in US$ or Euro) It is not a surf site but it has some splash pages before you enter to earn revenue for the site. Note:- Earnings made at midnight server time which is 5pm GMT. Started again as 2% daily for 70 days then hit by DDoS attacks then finally closed with no warning on 9th March due to collapse of sister site SurfProfitPro. It ran for about four and a half months. EgoldSplash is a 'surf site' where you earn 13% daily for 10 days on your 'ad package' to surf 13 sites daily for 13 seconds each. Payment to your e-Gold or AlertPay account is instant. Each 'ad package' is a dollar and you can have up to $2,000 invested. Purchase your package before surfing to earn on it the first day. 'Surf sites' tend to last longer but you must surf for a few minutes each day for 10 days to earn. Don't upgrade just before you go on holiday! Upgraded members shown. Approx 3 times more members have signed up. ArivaFund pays 25% for 5 days or 150% after a week. Deals are in e-gold and Liberty Reserve currency. This is the classic HYIP scheme using Goldcoders script and 25% return a day that has been so successful in the past. Should be good for 20 days or so. 28/11/07 22:55 over 100 new members today! Note:- Total Deposit includes compounded monies so actual new money deposited will be much less than the figure published. TimesProfit pays 25% daily for 5 days or 150% after 5 days. Deals are in e-gold, Liberty Reserve and Pecunix currency. Another classic HYIP scheme with 25% return a day that has been so successful in the past. HGW-Invest pays 14% daily for 9 days or 119% after 6 days or better. Deposits from $1 to $1000 daily. Deals in e-gold, Liberty Reserve and Vmoney. The site was attacked after a few days but started again stronger than ever which says a lot for the determination of the admin. Gold'n'Cash which pays 13.5% daily automatically into your e-gold account for 10 days after viewing 12 ads a day. Works out to 35% profit in 10 days. The old formula but one that works if popular and this one is getting about 20 new members a day! Works with e-gold and e-bullion. $13 minimum upgrades but you get $1.75 of that back immediatly you surf your first 12 sites. You must upgrade first - then surf. WARNING.- admin not replying to support tickets; usually the first sign that closure is soon. My comment above - Get in early! - never more true than here. I invested within a few hours of start time. With a 7 day cycle you get your capital back after 5 days. So I made 20% profit on the 6th day and was just a few hours short of my 7th payment for the full 40% profit!